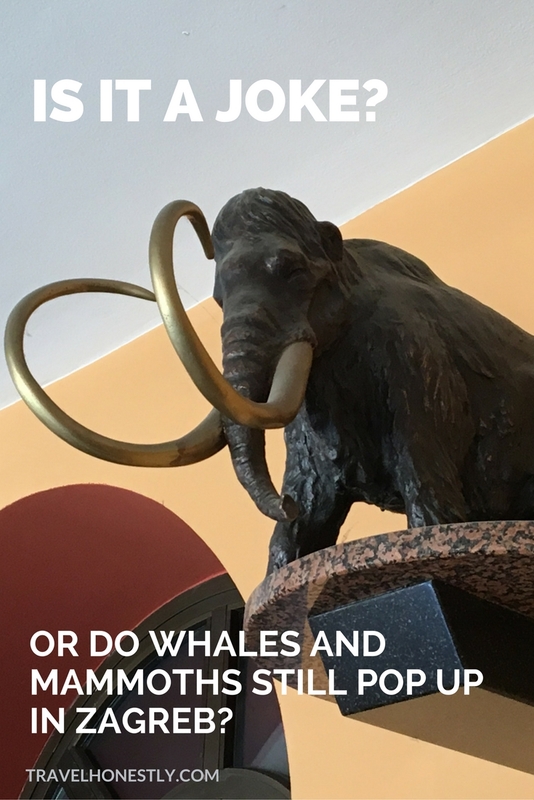 Zagreb animals: do whales & mammoths still live in Zagreb? I do. I live with two cats and the younger black-and-white Max (a.k.a. Batman) drilled his way into my heart and into staying. I also love animals in art, animal metaphors, animal YouTube videos, animal-shaped slippers… things that have nothing to do with my rational brain. It’s a wildly inconvenient (think ruined sofas) but deliciously sweet obsession. Human love for animals runs much deeper than the attachment we have to our pets. Just admit you shed a few tears when you saw ‘The March of the Penguins’. This enigmatic human-animal bond is part of our physical and metaphysical evolution. It’s why shamans draw their strength from animal spirits, why the first cave paintings were of animals and why even now so many artists continue expressing their emotions through either realistic or metaphorical animal images. Animal art is truly amazing. Even countries have animal emblems. Croatia has a pine martin and our currency is named after it: kuna. Cities are recognized by animal mascots. Go visit Madrid and you’ll be directed to their famous El Oso y el Madroño – The Bear and the Strawberry Tree. In Zagreb there isn’t just one animal but the whole bestiary. And I’m not talking about the Zagreb Zoo but about the city’s peculiar animal art. 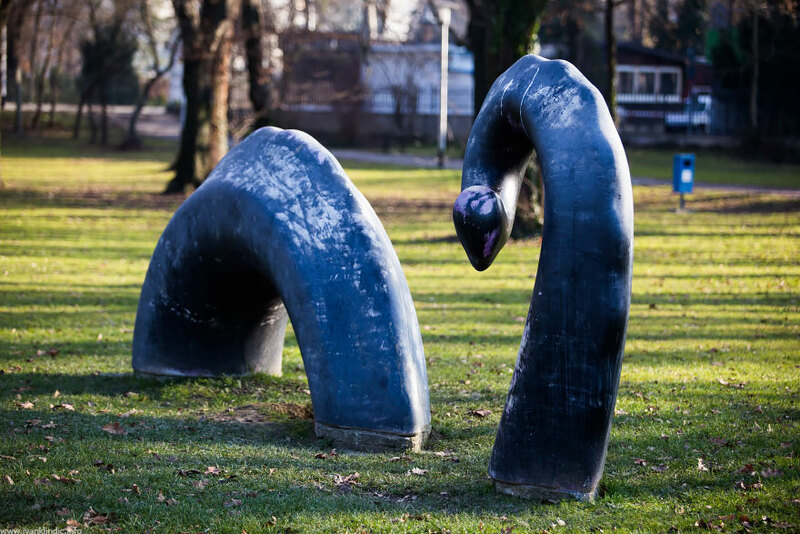 Many visitors are wowed by the number of gorgeous sculptures they see in Zagreb. Some say there are so many you never feel alone when walking around. 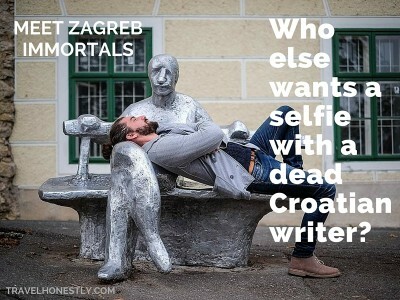 We have immortalized our writers and literary characters in such striking statues that you probably still have selfies with them in your albums. 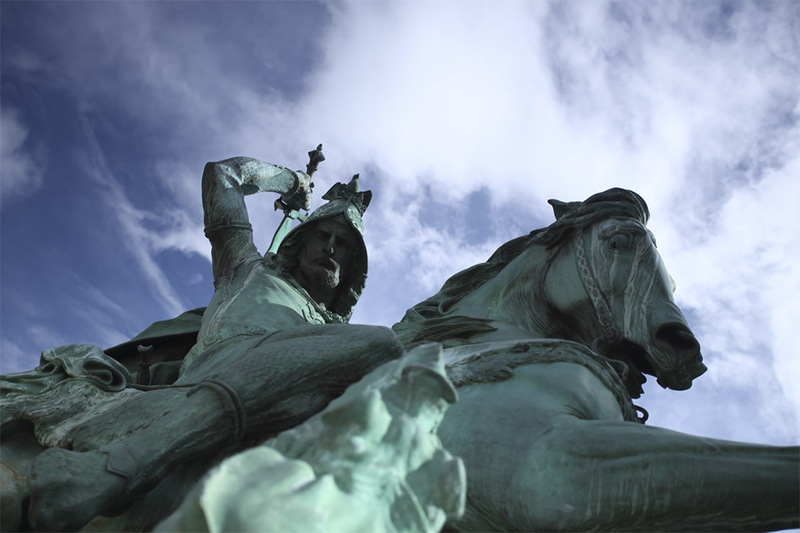 Even great heroes and statesmen on horseback exude more of an artsy than domineering flair. The animal art is wonderfully offbeat too. There are statues commemorating beasts that once lived where Zagreb is now. Others are mythical animals that lurk on roof tops or emerge from landscaped parks. And some creatures eerily appear where you least expect them. Only artists’ creative imagination can place them in such unnatural habitats and still make you sigh with awe. And we do need to be surrounded by forest or ocean fiends, even in the middle of our urban jungle. 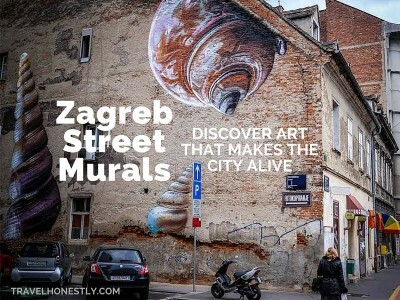 Zagreb boasts four horsemen statues: King Tomislav which makes the city’s landmark skyline, Duke Josip Jelačić on the main square and St. George killing the dragon – twice. According to the Christian legend, St. George fought and killed a dragon to save a beautiful princess and her village. For early Christians, a dragon was the symbol of all evil. So when villagers turned Christians as a way of thanking St. George, a dragon also became the synonym of heresy, an enemy of the Church. 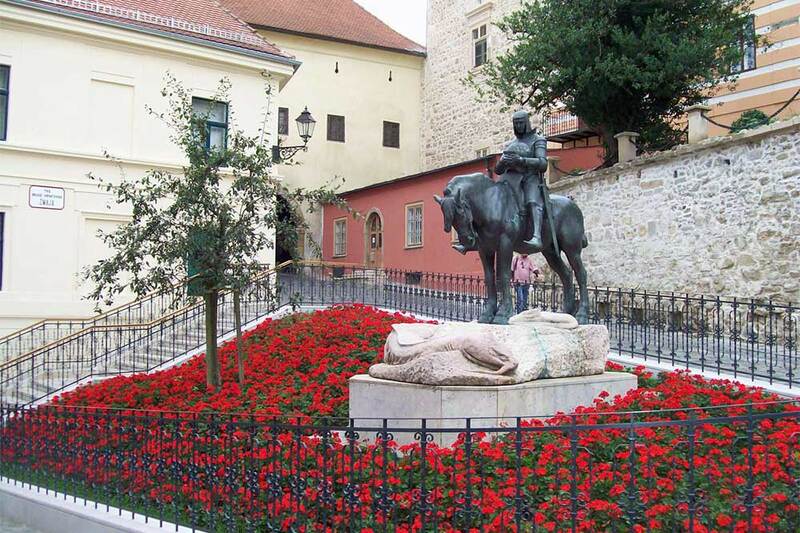 St. George killing the dragon by the Croatian National Theatre is one of Zagreb’s benchmarks. The statue was made in 1853 by Anton Dominik Fernkorn. It changed places twice (first Maksimir, then Strossmayer Square) before it was finally placed where it stands now in 1908. The second appearance of St. George by the Stone Gate is more unusual. It is a rare depiction of the two enemies after the fight is already over. St. George is shown as quietly standing over the dead dragon, praying for his enemy. Even though the beast is defeated, it’s not left without dignity. Although the statue was made in 1937 by A. Kompatscher and A. Winder, it was erected in 1994 by the Brethren of the Croatian Dragon, a Croatian historical and cultural society. 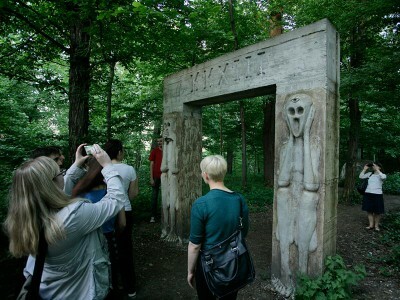 If you venture out to the enchanting outdoors of Maksimir Park, look across the street from the main gate. You’ll spot the Zagreb Nessie. Yes, it’s there and much more real than the one from Loch Ness. It’s a sculpture by Igor Briski called ‘The Touch’ (1989) but hardly anyone knows it by its real name. So if you’re looking for directions, ask about Nessie or a little worm. And don’t be surprised if Nessie wears a different colour when you pay it a visit. For good or bad, locals sometimes paint over it. This mysterious creature resides in front of Lauba – one of Zagreb’s coolest museums/galleries. She has human legs, no arms and a face that mixes human and feline features. Her elegant body is definitely of a cat, but so is her curiosity. The little fiend is set to peep inside the museum’s window. 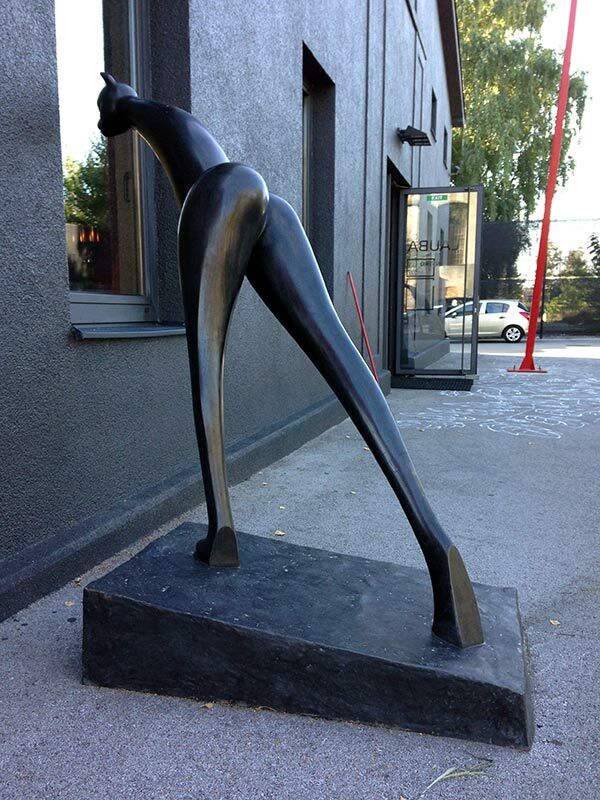 Cat Woman (2001) is work by one of Croatia’s most distinguished woman sculptors: Marija Ujević-Galetović. You may wonder what a dog has to do with construction, but Pluto was not an ordinary dog. An emaciated stray, he loitered around the construction site near Oktogon Passage in Bogovićeva street. Workers would give him food and water and Pluto soon felt he was home. 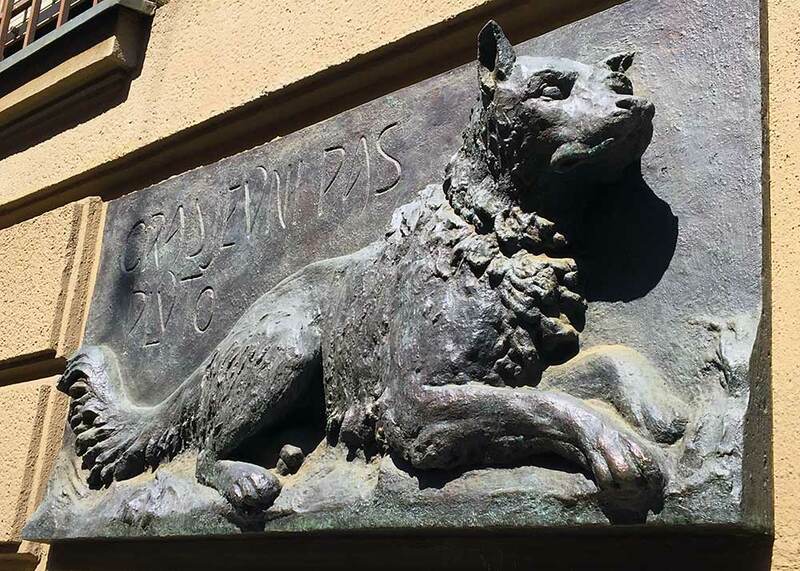 Like a true watchdog, he guarded the site from clay looters at night and became especially attached to the architect Josip Vancaš. One night Pluto was outnumbered and the fight cost him his life. Grief-stricken, the workers put up a monument commemorating Pluto for ever. This beautiful dog relief was tucked inside Oktogon Passage, away from tourists and locals. In 2013 it was moved to the outside facade in Bogovićeva street so that more people can learn about the brave Pluto. As stealthy nocturnal predators, owls have a special mythological status in many traditions. The Greeks held it a sacred symbol of the goddess of learning Athena. And because darkness is its natural environment, an owl is often connected with mystery and ancient knowledge. 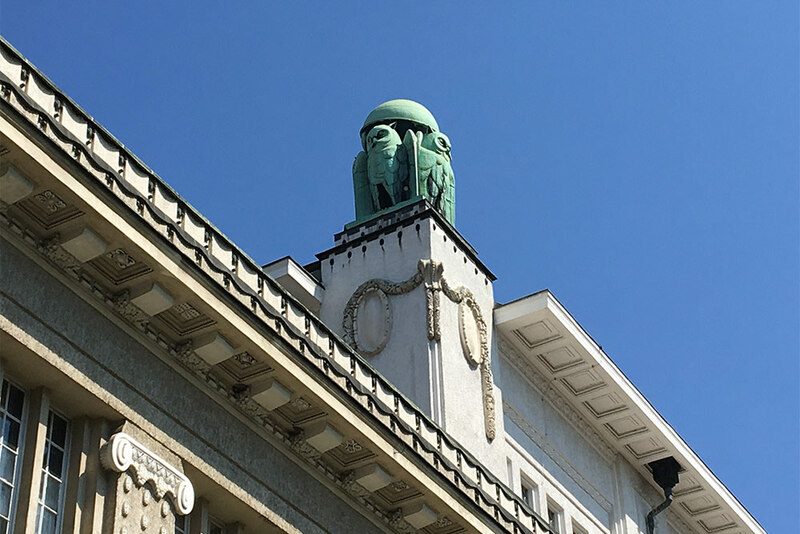 In Zagreb, you can spot 16 owl sculptures adorning the dome of the National Archives building. This remarkable work of Art Deco architecture was designed by Rudolf Lubynski in 1913. For decades, it housed the national university library, where generations of students and scholars worked to advance the academic thought. In 1996, the library moved to a new modern building and the Art Deco beauty became the State Archives. There are few animals that undergo such a fascinating transformation like a tadpole does when it turns into a frog. Because of this unique growth cycle, we see frogs as a symbol of change and rebirth. 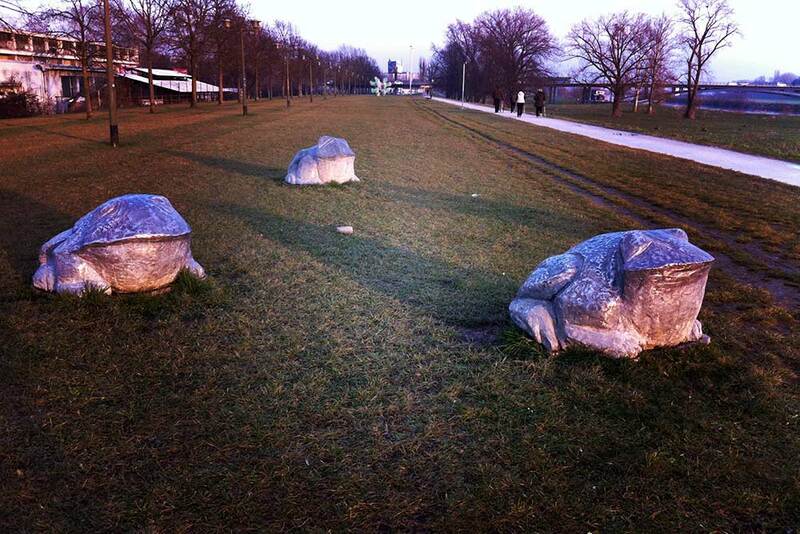 It’s not a coincidence that Zagreb frog sculptures line up the river Sava quay. For a long time, Zagreb’s river was its southernmost boundary. Until 1953, when the visionary Zagreb mayor Većeslav Holjevac moved the Zagreb Fair building to the opposite bank. This was the start of Novi Zagreb [New Zagreb], a sprawling residential neighbourhood of mostly socialist apartment blocks. Žabinjak [House of Frogs] is work of Stjepan Gračan (1994), erected with a host of other awesome sculptures. 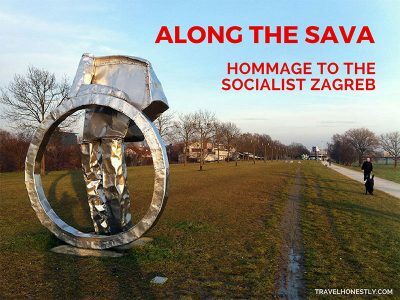 A walk along the Sava’s north bank is a perfect escape from the city centre, especially if you love art and socialist architecture. 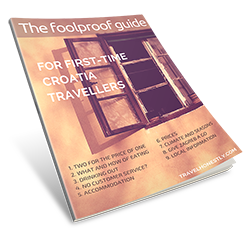 The city of Zagreb was founded in 1094, but life here existed thousands of years before. Archeologists found plenty of evidence in support of a continued social and cultural life. But they also came across remains of two wonderful animals: a woolly mammoth and a baby whale. 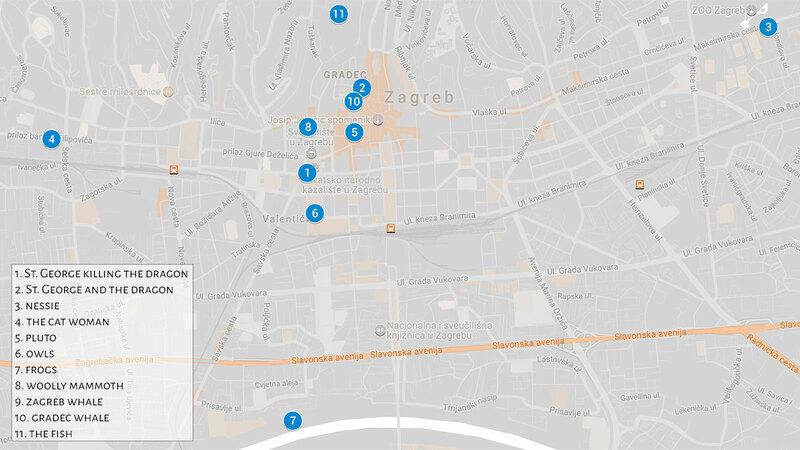 To honour this memory, three visionaries, Zoran Gregl, Nenad Jandrić and Željko Kovačić, kicked off the award-winning project ‘Zagreb before it existed’. They made replicas of excavated objects and mapped them to exact locations around the city. 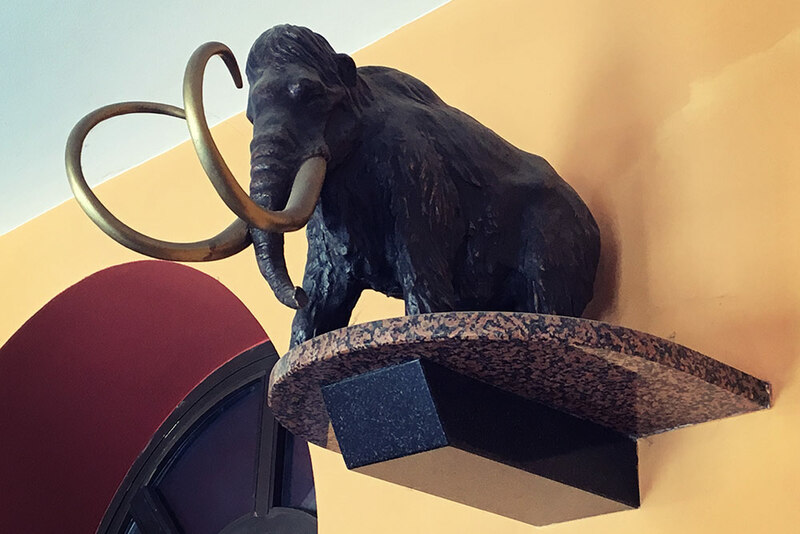 In 1992 a hip bone of a woolly mammoth was found on the site of today’s Gavella Theatre in Frankopanska street. This Ice-Age giant reaching 6 m in height became extinct 15,000 years ago. The original bone is kept in Zagreb’s Natural History Museum. But the memory of its presence is kept alive as a small sculpture at the entrance to the Theatre. 15 million years ago Zagreb was submerged under the Pannonian Sea. 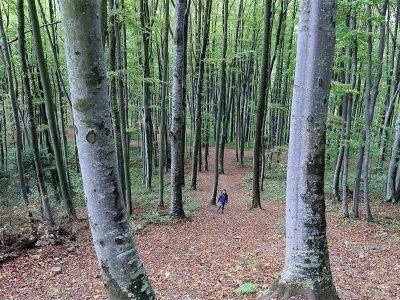 And in the western outskirts called Podsused, where the river Sava flows closest to the Medvednica mountain, archeological remains speak of a rich marine world. 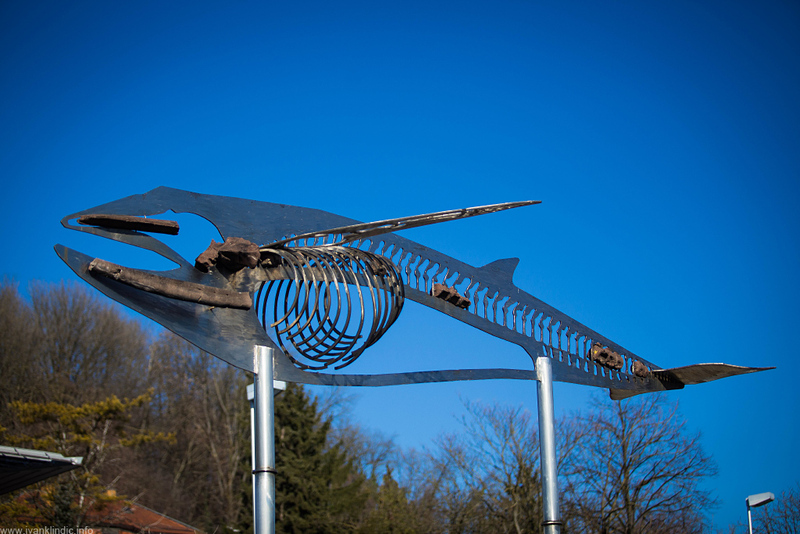 The most unique is a baby of the so called Zagreb whale – a 6-metre-long skeleton of the previously unknown whale species. They called it Mosocetus Agrami or the Zagreb Whale. This baby is now represented as a beautiful steel sculpture next to the stream Podsusesko Dolje. Still close to water, the only place where it can get stranded is in our memory. The cast of the bones is work of Slavimir Slaviček. The sculpture, which is the largest one in Zagreb, was made by Zdenko Šlibar. Speaking of water, the last two Zagreb animals are also creatures of the sea. 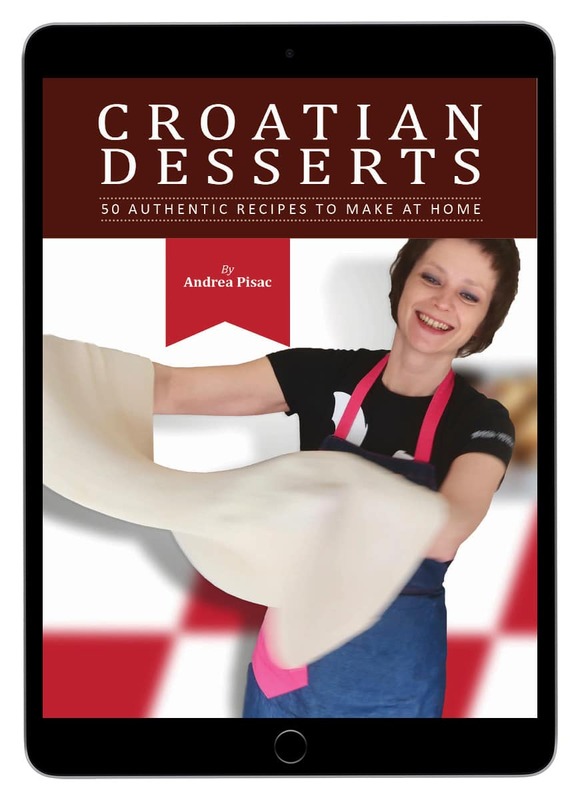 But they have little to do with the ancient Pannonian Sea. Two street artists placed them in an unnatural habitat so they can surprise and intrigue us. Or maybe also to remind us that animals have and always will be part of our collective imagination. 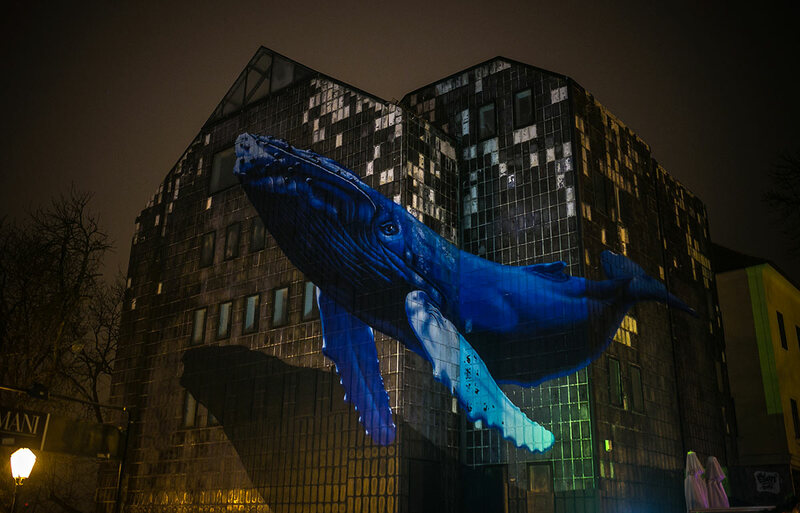 In 2015 French street artist Etien painted a giant whale on an abandoned Upper Town building on Gradec plateau. This superb anamorphic mural, voted by the Montreal Mural Festival among the top 10 in the world, quickly found home in the locals’ hearts. As one of the city’s top attractions, it only proves that Zagreb has a secret affair with these graceful sea mammals. 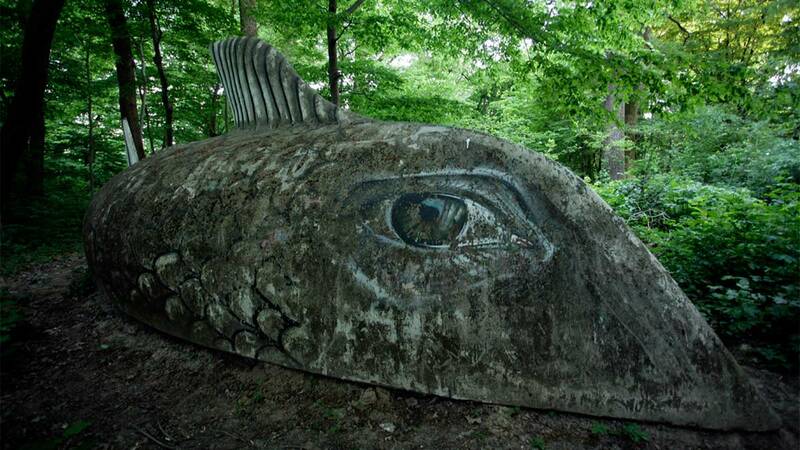 This charismatic fish created by the street artist Lonac lives deep in the Tuškanac forest. If you manage to find it, expect to fall for it immediately. The sculpture’s original name is ‘Unnatural Habitat’ and it was Lonac’s final work for the Fine Arts degree. His meticulous hyper realistic strokes use an old upside down boat for canvas. And as the elements slowly erode the paint, the fish displays more of the forest green than the marine silver. Soon it will be covered in moss, swallowed entirely by its habitat. So hurry to catch this time-sensitive beast. Now you see why Zagreb can’t have a single animal for its symbol. 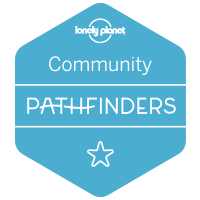 There are so many, waiting for you to discover them. You’ll enjoy the sculptures but you’ll also connect with animal spirits in your imagination – even in the middle of this concrete habitat. 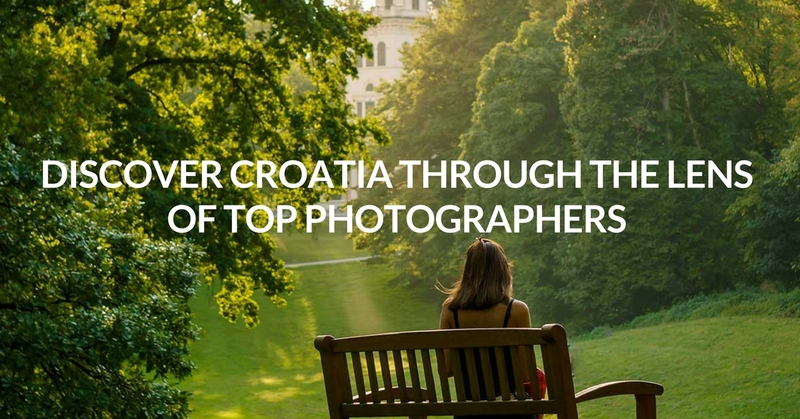 There’s many more unusual things to do in Zagreb. 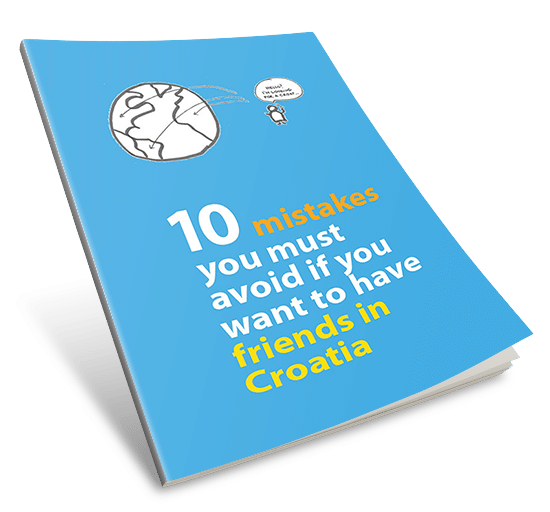 You can check them out in my ultimate guide! Actually that may be just scratching the surface. It would be great if people looked for the “bestiary” everywhere: doors, handles, eavestroughs, weathervanes, etc. Today I saw door decorations on Palmotićeva that had Scythian elk, lions and palm trees in relief. Beastly! You’re right…after I wrote it I realized you had to pick the Big Ones…so to speak. Otherwise it is an unending story. But now I’m hooked and look for any and all 3D effects on buildings, doors, facades, etc…and guess what? A lot of bestiary. And human forms of course.